Here’s a 30-minute Q&A with Vincenzo Natali, the director of Splice, which I recorded after a screening of the film last week. Vincenzo was very composed and self-effacing and was willing to answer any question (including a deliberately absurd one I asked early on). Those who haven’t seen Splice may want to skip through this podcast’s spoilers, which tend to come in the first few minutes. Though they might be vague enough (such as the name for the genetic mutation, Dren) not to spoil it for those without any familiarity with Natali’s solemnly goofy Frankensteinesque movie. I’ve cut out the truly pointless questions (“What was it like to work with Sarah Polley and …..”) and have cleaned the sound up as much as possible for something recorded on the fly. The first two minutes contain minor audio disruptions (listen to that soda can roll down the aisle! ), Natali starts out (within the recording) answering a question about the audience response to the more outrageous elements of his film. But after that, the sound is surprisingly clean. Some questions posed by the audience include why he likes to shoot with such small casts, what freakish scientific experiments he discovered while doing research, what his involvement was with the Cube sequels, and whether he was concerned that the far right would use Splice for their own political gain. After the Q&A, I did walk up to Vincenzo to ask another question, privately, which you’ll hear at the very end of the recording. Though it does spoil a bit of Act III. One question I didn’t record was when I asked Vincenzo (who also directed Cypher and Nothing) if he thought Sarah Polley had taken the lead role, that of a scientist trying to use cloning and genetic manipulations to cure diseases like Alzheimer’s, because she had directed Away From Her, also about Alzheimer’s. He hadn’t considered that angle but said Sarah thought the script for Splice was amusingly silly and was glad to be on board for a movie that had such a good sense of humor. 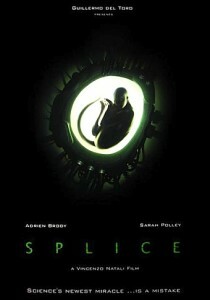 Splice opens nationwide on June 4th. Also, please ignore the generic look of the film’s poster; Splice is neither a rip-off of Alien nor Species — despite the deceptively mundane advertising campaign. 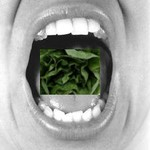 This entry was posted on Wednesday, May 19th, 2010 at 2:05 am	and is filed under Horror, Sci-Fi. You can follow any responses to this entry through the RSS 2.0 feed. You can leave a response, or trackback from your own site.